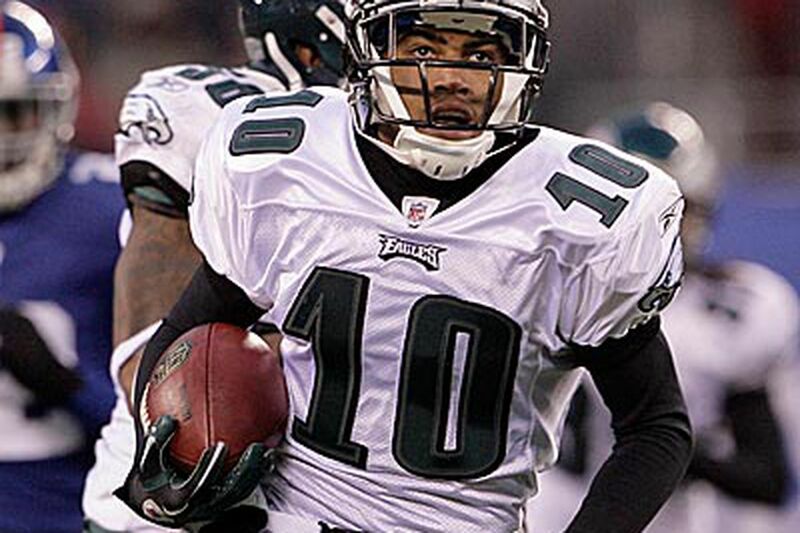 One possible solution for a big play from the Eagles' unproductive special teams would be inserting DeSean Jackson on certain punt returns, a role he has filled in the past and continues to practice for the Eagles. Special-teams coordinator Bobby April compared Jackson to a pinch-hitter and said Jackson is ready if the situation presents itself. "You may get your wish this week, you might get it in two weeks," April said. "He's always ready to go." The Eagles have a chance to break out of their special-teams rut Sunday against the Detroit Lions, a team that has struggled in punt coverage. The decision to use Jackson likely would be up to Andy Reid, not April. "That's the coach's decision," Jackson said Thursday, "but anything for the team that would help give the team a spark." Damaris Johnson, the Eagles' rookie punt returner, is averaging 6 yards per return and is ranked No. 28 in the NFL among returners with more than six returns. Jackson already holds the franchise records for punt-return touchdowns with four, and would provide a home-run threat to a position that barely hits singles. "I like scoring touchdowns, I like making big plays," Jackson said. "That's the type of guy I am, type of player I am." The Eagles thought they were upgrading the unit when they signed Johnson as an undrafted free agent and drafted Brandon Boykin. Neither has distinguished himself in the first five games. Boykin's longest kickoff return was 29 yards; he averages 21.2 yards per return. "Close to breaking one, probably not," April said when asked whether Boykin or Johnson has come close to a big return. "You've got a good argument, and I don't have much defense statistically, but I do believe in the guys." Entering the season, Eagles running back LeSean McCoy expressed a specific desire to improve as a receiver out of the backfield. He has 18 receptions for 86 yards and a touchdown - not much improvement over past seasons. "It's a working process. It's a long season," McCoy said. "I think we're getting me involved in the passing game. Last week, we just had a touchdown. We got the matchup we wanted, I went around the guy." McCoy identified the screen game as an area for growth. Offensive coordinator Marty Mornhinweg agrees with the notion that quarterback Michael Vick appears more comfortable when the Eagles play with a no-huddle offense. They have gone into the no-huddle at different points in the season, and Vick plays better than when the team operates at a slower pace. Former Eagles running back Ricky Watters will serve as this week's honorary captain. Watters, who played for the Eagles from 1995 to 1997, averaged 1,704 yards from scrimmage during his three seasons with the Eagles and twice represented the Eagles in the Pro Bowl. Contact Zach Berman at zberman@phillynews.com, or follow on Twitter @ZBerm.